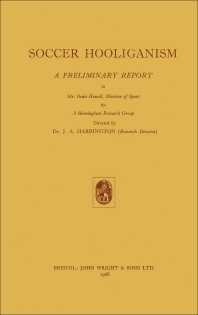 Soccer Hooliganism: A Preliminary Report focuses on the study of the intrusion of hooliganism into sports, especially football. This book begins with a description of the methods of inquiry that surveys and evaluates existing opinions regarding the problem of football hooliganism, followed by a discussion of its extent and seriousness. The nature of football hooliganism, which includes rowdysim, horseplay and threatening behavior, foul support, soccermania, football riots, and vandalism are also reviewed in detail. Injuries resulting from hooliganism are also elaborated. Other topics include the characteristics of convicted hooligans, causes and epidemiology of hooliganism, and ethological study of football crowds. This text concludes with a deliberation of the control and prevention of hooliganism, including a summary of the main findings and recommendations of the problem. This publication is suitable for specialists and medical practitioners concerned with the psychiatric studies of convicted hooligans or misbehavior among spectators. How Serious is the Problem ?